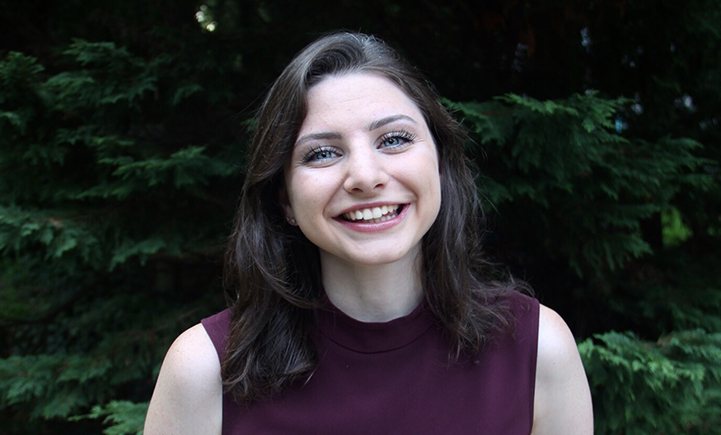 Following in her father’s footsteps, Sarin Grey ’18 spent her undergrad years at Binghamton University studying economics. But while her father went on to law school, Grey hopes to break into the world of marketing. That’s what drove the Long Island native to stay at Binghamton to pursue her MBA. “I thought the quantitative background I picked up through my economics major and the strategic skills I’d pick up in the School of Management (SOM) would be a good mix,” she said. And because of the Harpur Fast-Track MBA program, this “mix” would take just one extra year to complete. The accelerated option allows Harpur students to earn both an undergraduate degree and an MBA in only five years of study. As she looks to graduation this spring, Grey will be wrapping up an academic career with both a versatile skill set and an impressive résumé that includes two major internships and a leadership role within a student organization. Her first internship was with Publicis Media. Grey met a recruiter at an on-campus job and internship fair and lined up a position that would allow her to refine her search engine optimization skills in a real-world setting. “Learning more about SEO and [online] search has been very valuable, and having that search background has helped open up more opportunities,” Grey said. 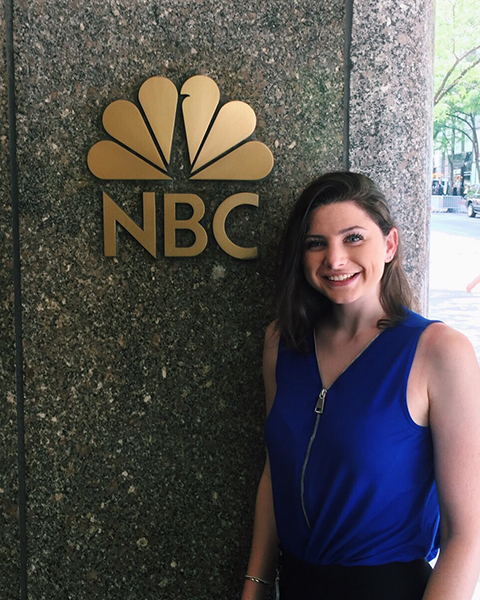 One of those opportunities included another internship, this time spending a summer at the famed 30 Rockefeller Center in New York City working for NBCUniversal. After applying on a career website, Grey was notified that she was accepted as a digital media intern with the company’s Owned Television Stations division this past summer. While most affiliates are owned by different television companies, NBCUniversal owns and operates a group of 29 local NBC and Telemundo television stations and their digital platforms. Grey would be working with different teams across the division, helping fulfill the needs of the various stations. One of those markets was Boston, where she helped with a campaign that encouraged viewers to download an app to their mobile devices. She also helped with NBCUniversal’s annual Clear the Shelters initiative, which encourages people across the nation to adopt pets from local shelters. “The entire organization comes together for Clear the Shelters — local TV stations, theme parks, celebrities — everyone comes together to help. I helped with the creative toolkit that each of these teams could use to promote it and was collaborating with a lot of people,” she said. Grey was fortunate to be interning while the 2018 World Cup was happening, and it was an opportunity for her minor in Spanish to come in handy. TeleXitos, a Spanish-language TV network that NBCUniversal owns, would be airing reruns of some of the games, and Grey was tasked with helping promote the broadcasts across social media. She also used the internship as an opportunity to network, meeting with employees from across the organization to get a full picture of how it operated. Overall, the NBCUniversal experience prepared her for the graduate-level marketing classes she’d be taking when she returned to campus in the fall. Grey serves as the vice president of internal affairs for BEAM. Her favorite MBA class so far has been Professor Manoj Agarwal’s Optimizing Customer Strategy course. The course teaches students how to incorporate quantitative and analytical methods to help support sophisticated decision-making as it relates to marketing. Like most Binghamton University students, a good portion of Grey’s learning has happened outside the classroom. Grey serves as vice president of internal affairs for BEAM (Business, Entertainment, Advertising & Media), a group that offers students interested in the fields of communications, marketing and advertising a chance to develop relevant skills. 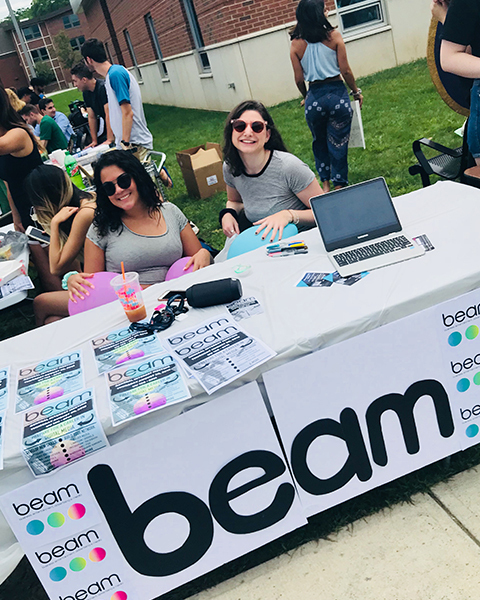 BEAM holds workshops that teach students everything from website creation to photoshop and also holds case competitions through partnerships with real-world organizations. “The group is heavily focused on digital entertainment, because that’s where the industry is shifting, and we aren’t limited to SOM students. We wanted to include other schools within Binghamton as well, to make sure everyone interested in these areas was getting these opportunities,” she said. As her Binghamton journey starts to wind down, Grey believes her involvement with more than one discipline will open up more opportunities down the road. “Despite not having a business background, staying for an extra year to earn an MBA has been an excellent choice because I’ve gained exposure to so many different areas that I wouldn’t have otherwise. Not having that business background hasn’t held me back. If anything, it’s helped me,” she said.